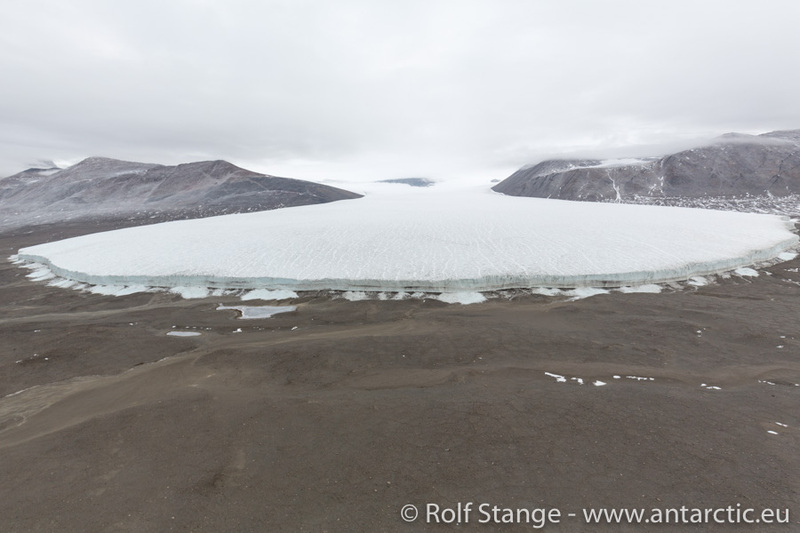 We went around Ross Island during the night to arrive early morning at Cape Crozier, where Ross Island and the Ross Ice Shelf meet. 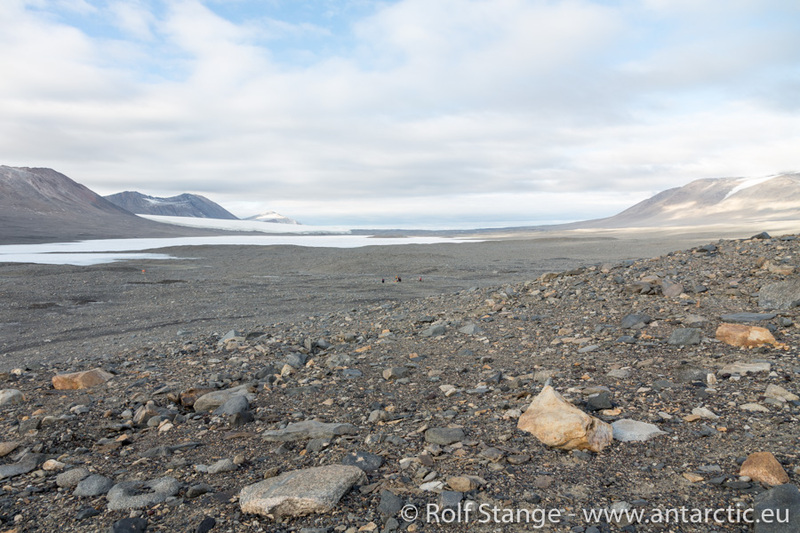 These steep volcanic slopes are the place where Apsley Cherry-Garrards famous „Worst journey in the world“ took place, that adventurous and dramatic search for Emperor penguin eggs that were then ignored by scientists for a whole century. 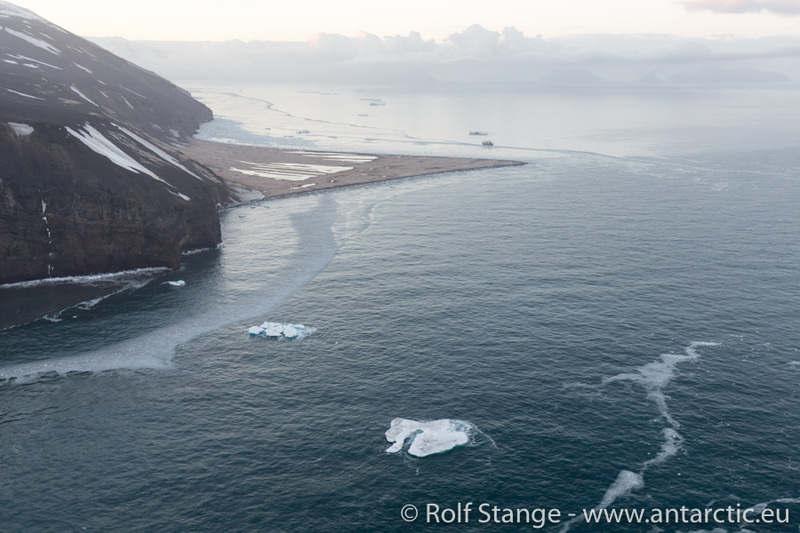 The ice shelf begins at the very same place just ahead of us to disappear behind the horizon to the east. You could follow it for quite some time to always see the same picture, with „the great barrier“ getting lost in infinity. A very impressive image! But hard to photograph. And even harder to get near to. 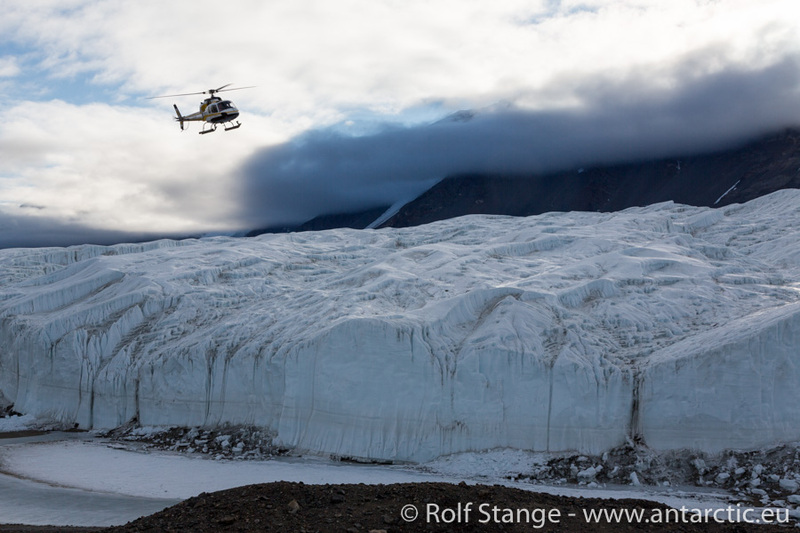 Our plan to land by helicopter on the ice shelf or at least to make a flight along the ice cliff does not materialize. We are faced with 35 knot (force 8) wind, which is far too much. 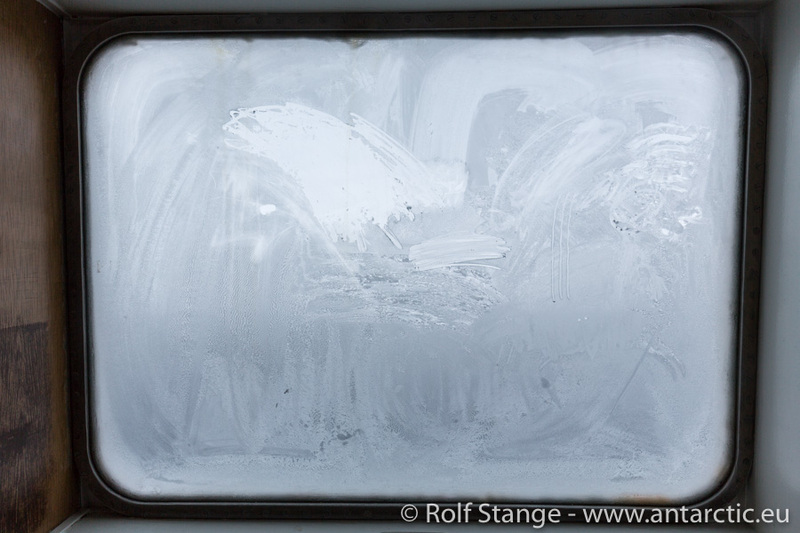 Icy cold it is indeed outside, combined with an air temperature of -10°C! It is such a thing with antarctic stations. They are interesting, they provide the world with significant knowledge. They are political, a display of power within the Antarctic Treaty System, always the flagg up in the wind. They are curious, from historical to futuristic. 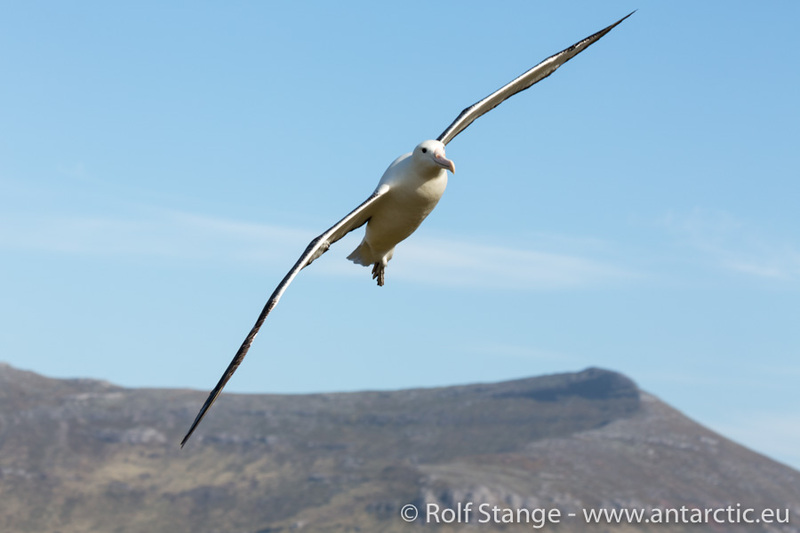 If you happen to visit Antarctica, then it is quite likely you will want to see one of them. These stations are usually not places of great natural beauty and anything but pristine. 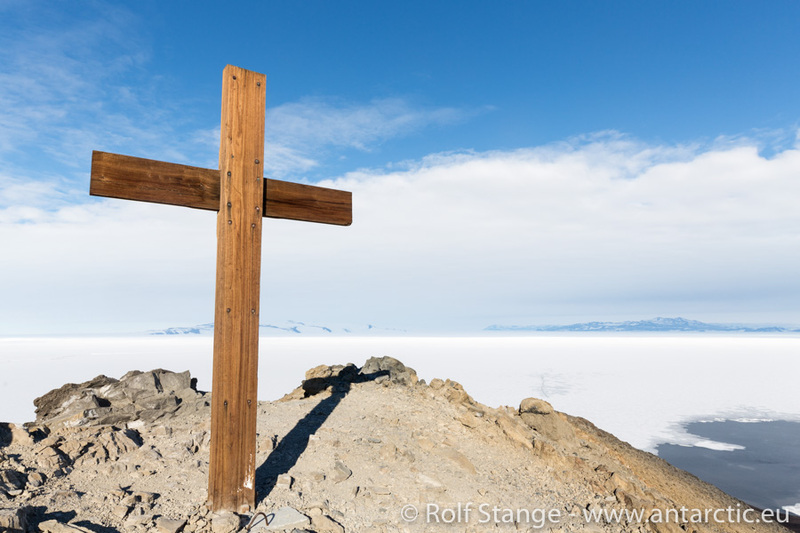 If anyone has left their long-lived traces in Antarctica, lasting signs of human presence and activity, including signs of destruction, then it is these stations (and not tourists, by the way). Anyway, these stations are the kind of place of which many say before visiting that they want to see it and after visiting, it could have been nicer rather to go to a more nature kind of place. The famous US-american McMurdo Base is in many ways a magnificent specimen, regarding size, visual impression and political power. 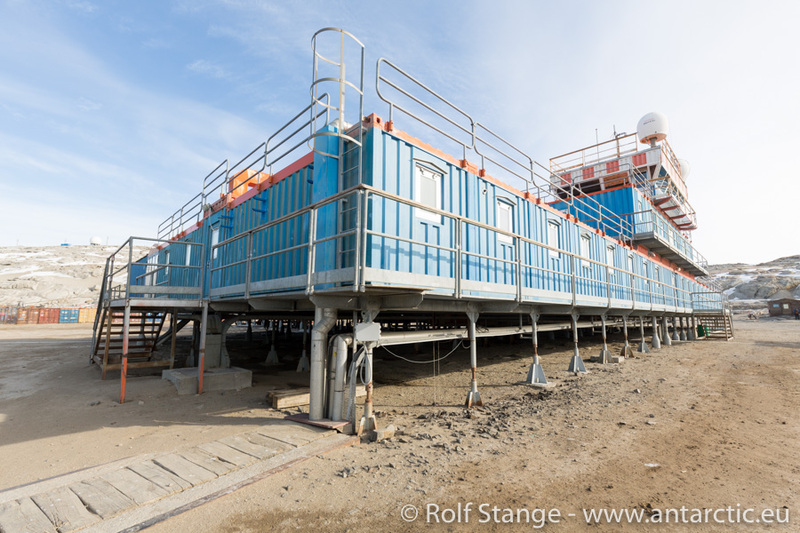 It is the hub for the Amundsen-Scott-Base on the South Pole, for logistically challenging projects in deep field such as ice core drillings in very remote locations and the more or less constant field activities in the comparatively near surroundings: Dry Valleys, Ross Ice Shelf, Mount Erebus. 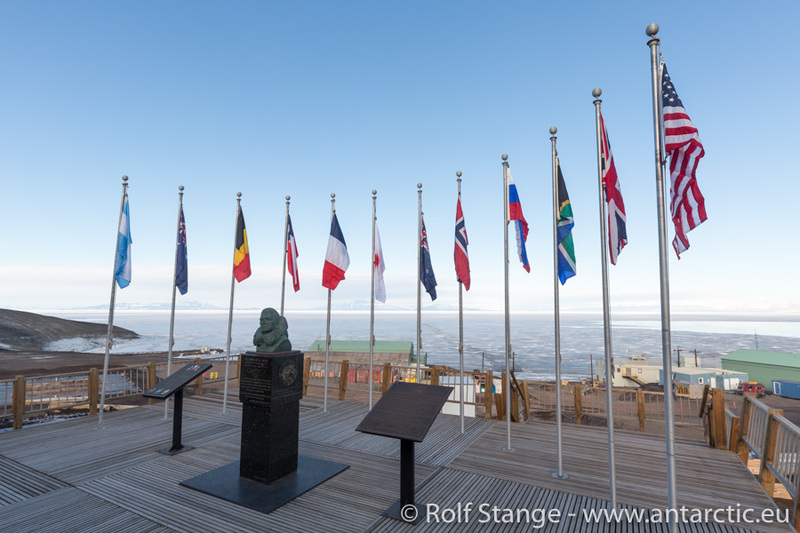 There are about 1000 people working in McMurdo during the busy summer season. Call it coincidence or the urge to find a location as far south as possible by ship common to both expeditions: this was also the place where Scott wintered during his first antarctic expedition, with Discovery. 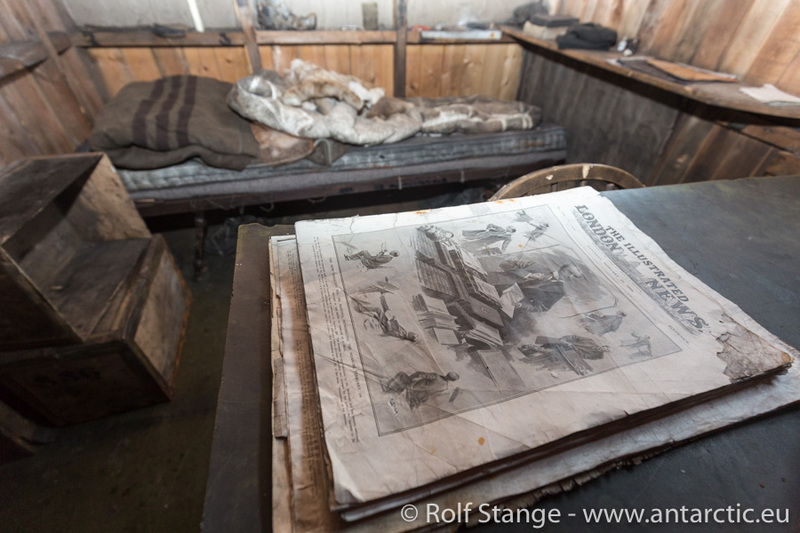 His hut, the second-oldest one in Antarctica after Borchgrevink’s Cape Adare buildings, is at Hut Point, a few minutes walking distance from MacMurdo Base (click here for some 360 degree impressions of Discovery hut). 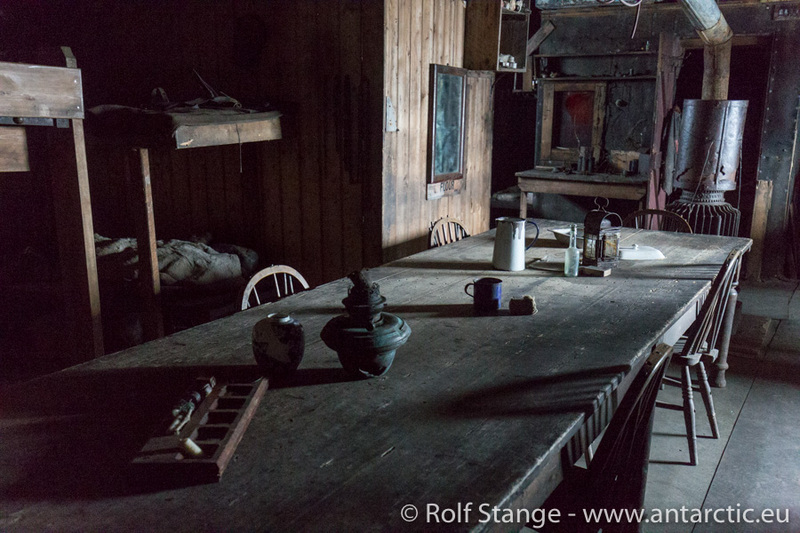 They actually lived on their ship, the Discovery, which was frozen in the ice next to Hut Point, so the hut is not as big and comfy as the Terra Nova Hut at Cape Evans. And that is altogether the programme for today. The weather looks great and it is supposed to remain stable during the day, a change being predicted for the evening only, and it is said that the Americans are well in controll of their local weather. We will get back to that later. 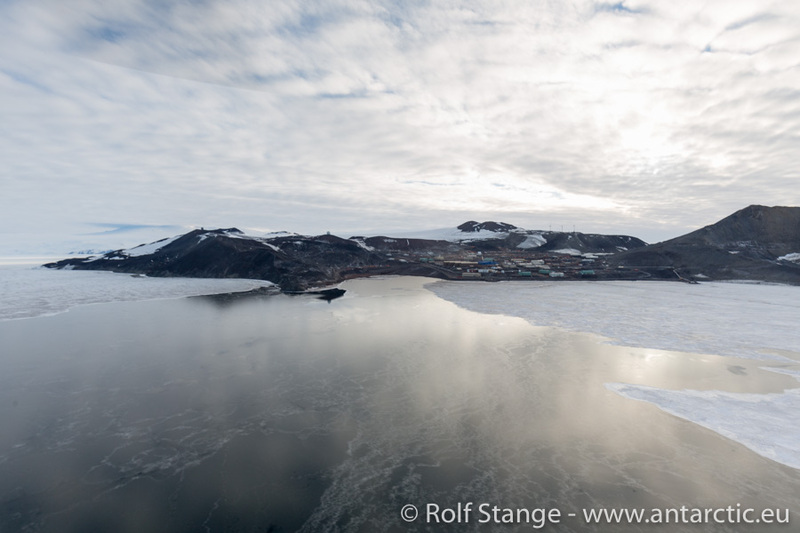 There was, anyway, nothing in the way for the helicopter flight over the fast ice to McMurdo Base. The sun was even shining from the blue sky. Lovely! During our visit four years ago, the Americans did live up to all clichés: There was not much more than the frequently repeated advice that we should quickly move through the station to Hut Point, preferably without even touching the road and without looking left or right. Questions for anything left or right of the road were answered very efficiently: „that is not authorized, and I am not authorized to authorize this.“ Today is in a stron contrast to this: our hosts are very friendly, they have actually organized a group of guides to show us around. 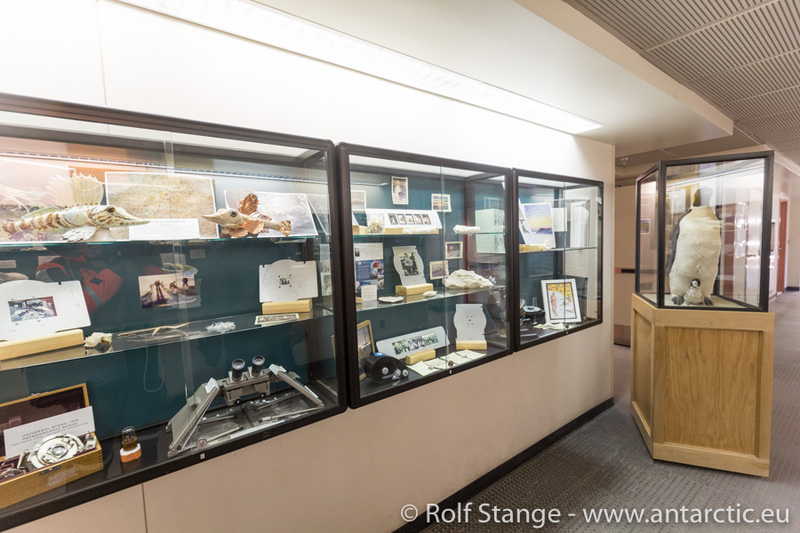 The tour takes us in small groups through some important facilities, including the science building, the main communications building, the chapel, the coffee house where we have our lunch (which we brought with us from the ship), and there is, of course, a souvenir shop. 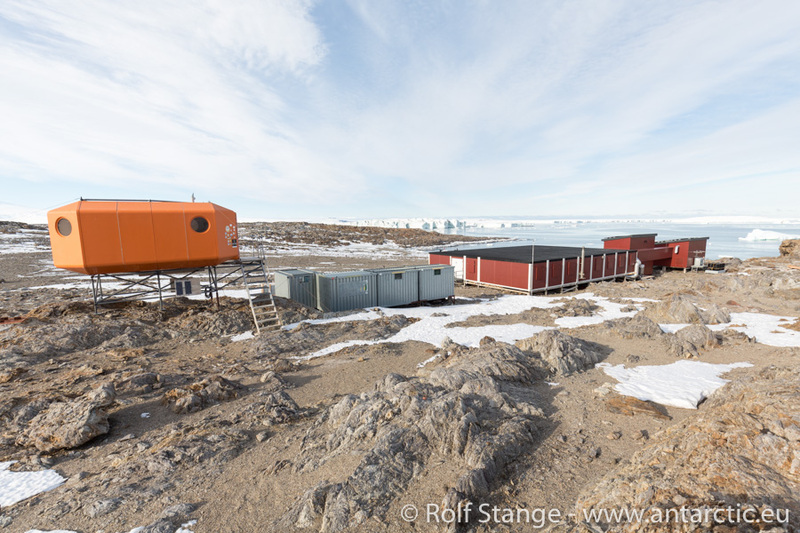 You can spend a lot of time at Hut Point, looking over the station, the near-by fast ice, and of course visiting the hut. 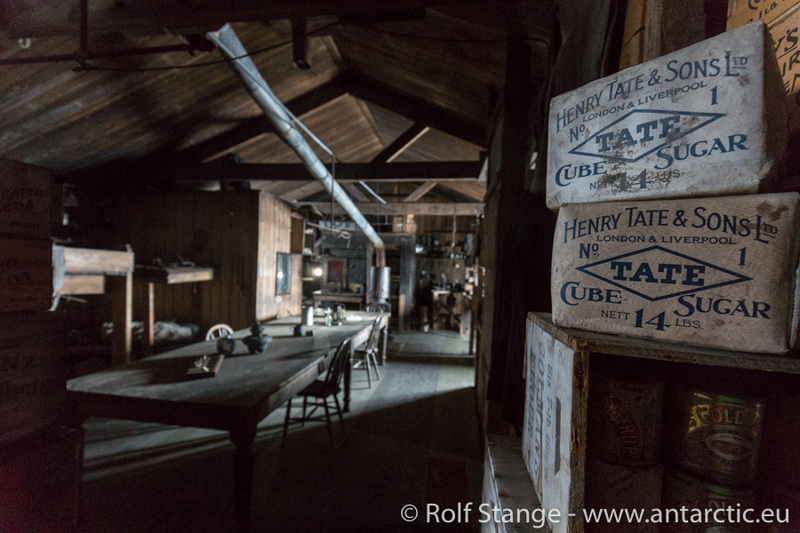 Another holy grail in the history of Antarctic exploration. And then there is Observation Hill on the other side of the station. A steep hill of volcanic rocks, as everything here, with a path leading up to the top, which is about 230 m high. 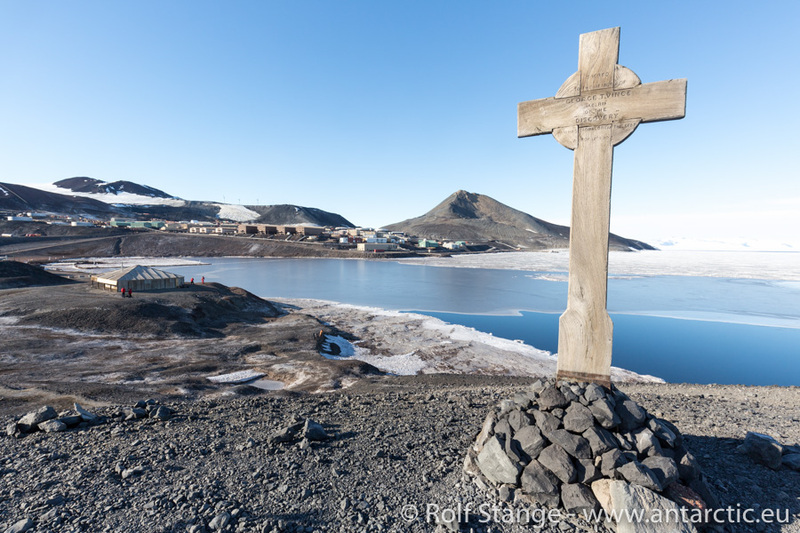 It is a stunning view from the cross that was erected there as a memorial to Scott and his men who died in 1912 on their return trip from the South Pole. You can almost see or at least imagine to see the place where they had their last camp out on the Ross Shelf Ice. They were never retrieved, they are still out there, deeply buried in the ice these days. 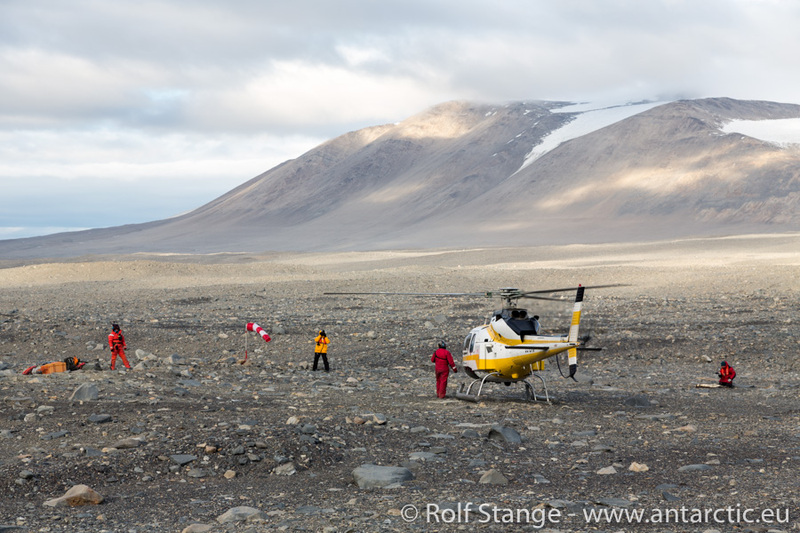 Our retrieval is still to come, the helicopters are already flying again, and then things are getting a bit more interesting than we want them to be. The weather change predicted for tonight has decided to come a bit earlier than originally predicted, some clouds and wind are coming up. The lovely warmth of the sun gives way to a biting cold. We do not have to wait outside, nobody is going to freeze or to starve to death here, but the visibility which our pilots depend on is certainly not improving. The numbers of those waiting is reduced by four or five helicopter after helicopter, a procedure that takes its time. 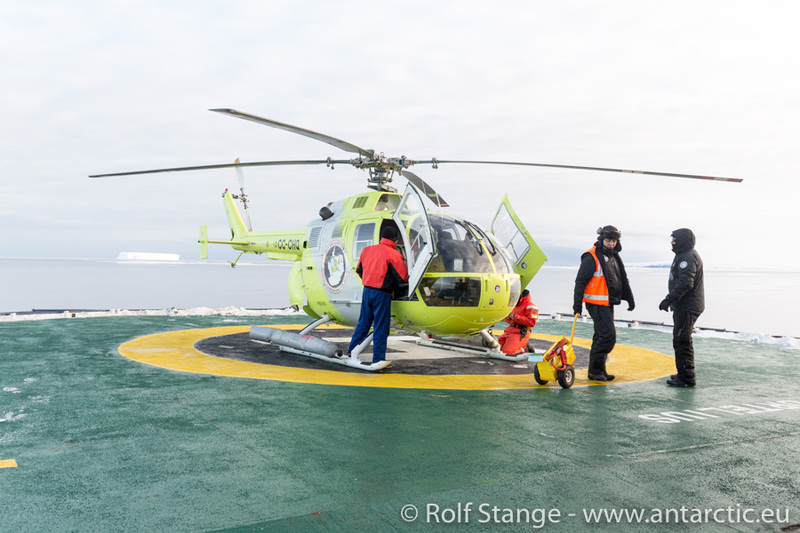 Finally, all passengers are back on board, only two last helicopters for us guides, but I almost doubt that we will make it … the next helicopter leaves, I am standing at the heli pad with two colleagues and we are anxious to hear the sound of the engines again soon. 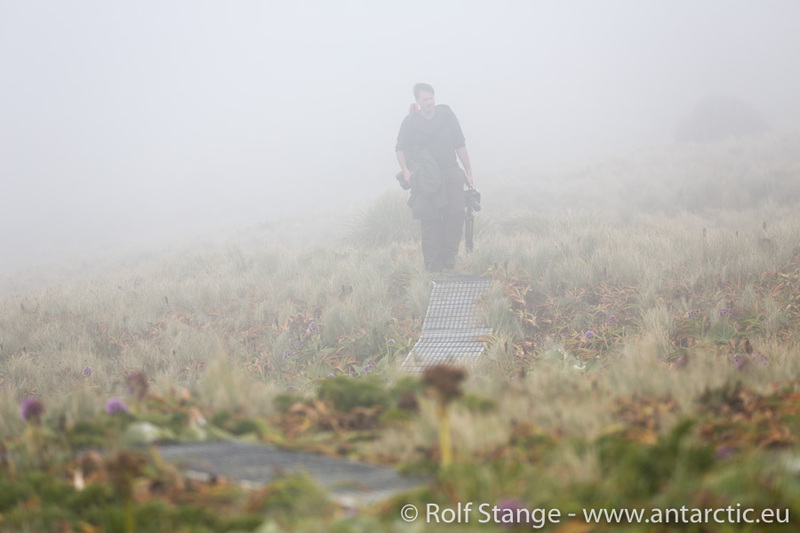 Observation Hill is a mere silhouette in the thin fog now, I wonder if that will be good enough? If not, we may well be forced to enjoy american hospitality for some time, and I do not want to imagine the troubles that would come with that. And I don’t have to, soon we here the noise of the helicopter, which is on the ground moments later. Julio, the oldest of the three pilots, is keen on getting out, that becomes pretty clear as he takes off and pushes the throttle. Thank God, the fog is just hanging around McMurdo Base and Ross Island, and it is clear again as soon as we get out over the sea ice. Soon we are all back on board. Hallelujah! 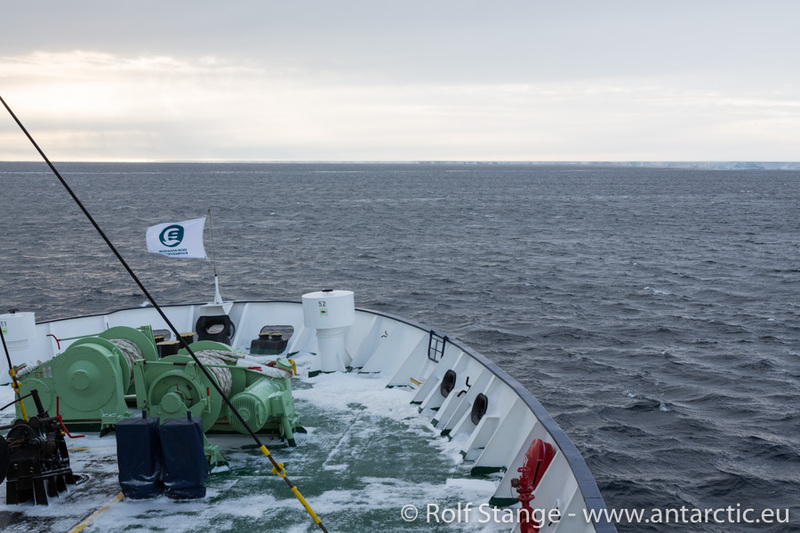 During the night, we reposition across the McMurdo Sound to Ross Island, aiming for Cape Evans on the foot of Mount Erebus. This is where Captain Scott had his hut built during his final expedition, with the famous ship Terra Nova. 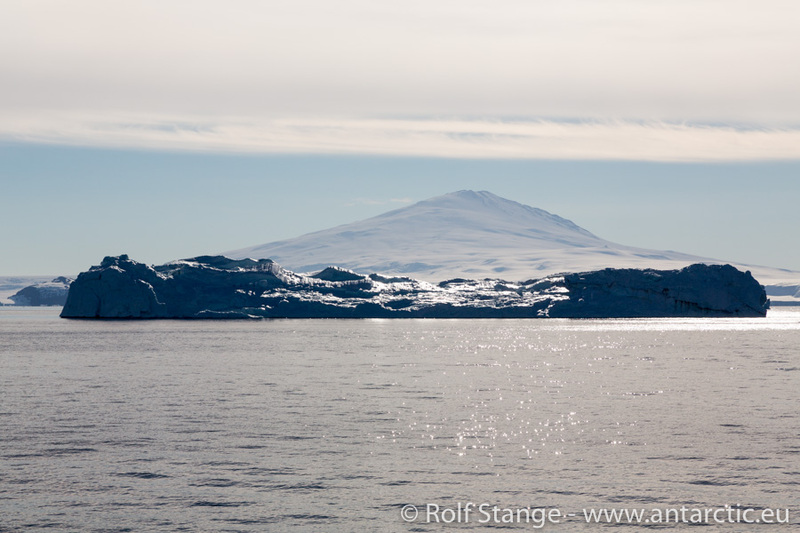 There is not much to be seen of Mount Erebus today, its mighty silhouette remains hidden in the clouds today. The stiff southerly breeze brings somewhat mixed feelings, but at least the landing site is on the northern side of Cape Evans. Offshore winds are always good for Zodiac landings, or rather, at least not as bad as onshore winds. It was a bit of an operation to get the Zodiacs ready. 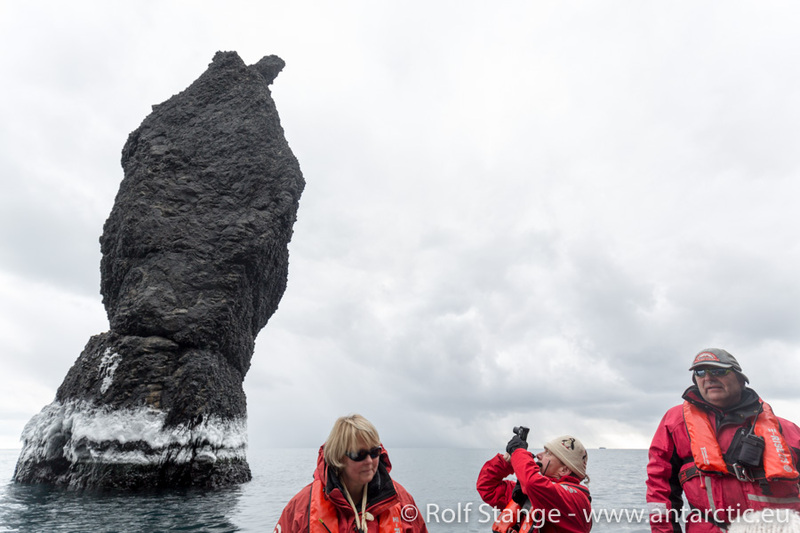 We, the guide team, board the first boat with some scepticism, to have a look at everything from waterlevel. The beach as such is fine, the peninsula gives nice shelter from wind and waves from this direction. Well, the beach is not the problem. And we are certainly willing to accept the Zodiac ride, which is long, wet and very, very cold. But the transition from the ship to the Zodiac is challenging in these conditions. I observe it for a while, and as the Captain promises to use the ship to create a sheltered position at the gangway, I make a decision: let’s go. Keep a good eye on wind and weather and on the situation at the gangway, be ready to abort the operation at any time, and not too many people on shore at any one time, in case we need to get everybody back to the ship in a hurry. All these thoughts and some more go through my head in such a moment. Soon, there are things to be done. 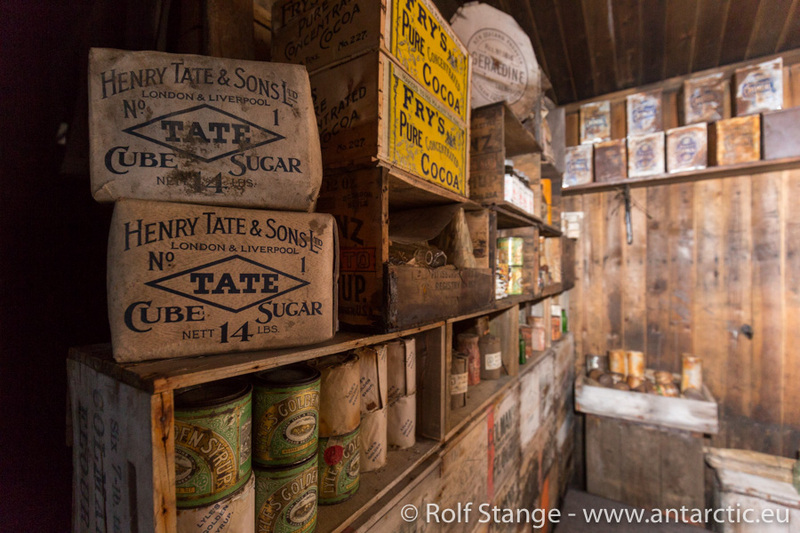 The magical moment to open the door to Scott’s hut and enter the hallowed halls, where every board in the wall, every cup on the cupboard and every glass on the laboratory table still breathe the spirit of 1911. 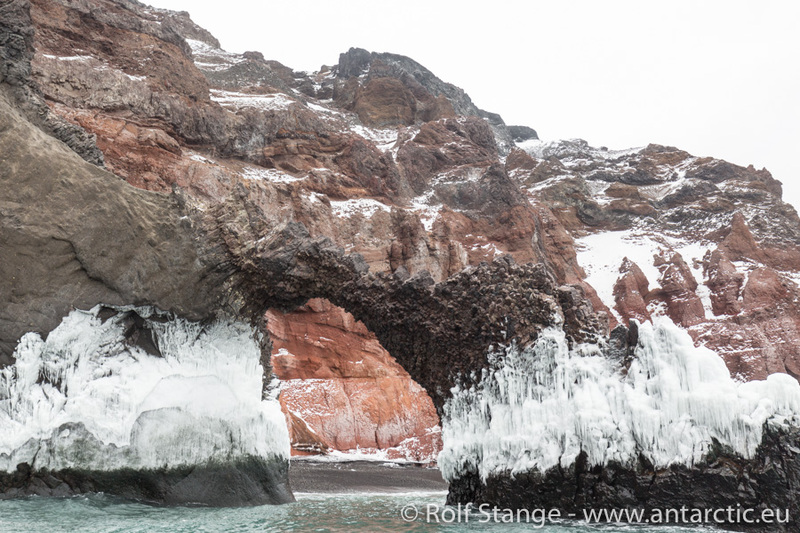 Ice-encrusted yetis step out of the Zodiacs one by one. 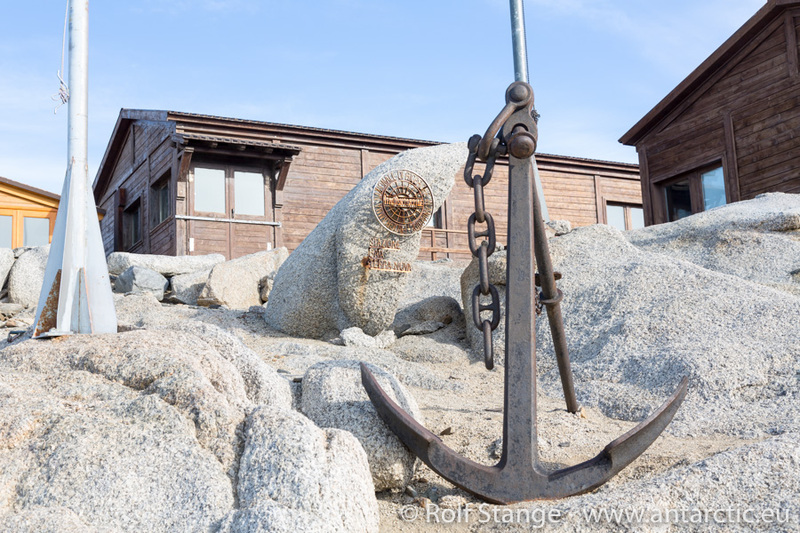 At the entrance to the hut, ice and snow are removed from clothes and sand and gravel from boots, and we have small groups entering the hut, while others take a little walk to the cross on Wind Vane Hill. 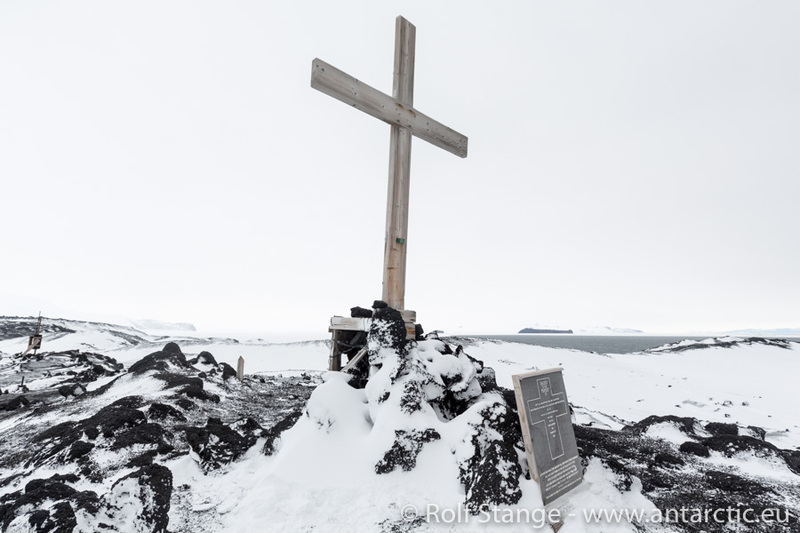 The cross is a memorial for the three men of Shackleton’s Ross Sea party who were lost during the 1914-17 expedition with Aurora. Then we have Zodiacs circulating again, taking people back to the ship, most of them probably ready for a hot shower and a hot chocolate, and bringing others here who are keen to make the pilgrimage to this famous place. Meanwhile, the ship is closer to the shore, making the Zodiac ride considerably shorter, and the wind has lost some strength. Things are getting a bit more relaxed, everything is working well. Finally, we can lock the door again and leave it all behind. After Taylor Valley yesterday, with Cape Evans we have been successful with another one of the big places in McMurdo Sound. 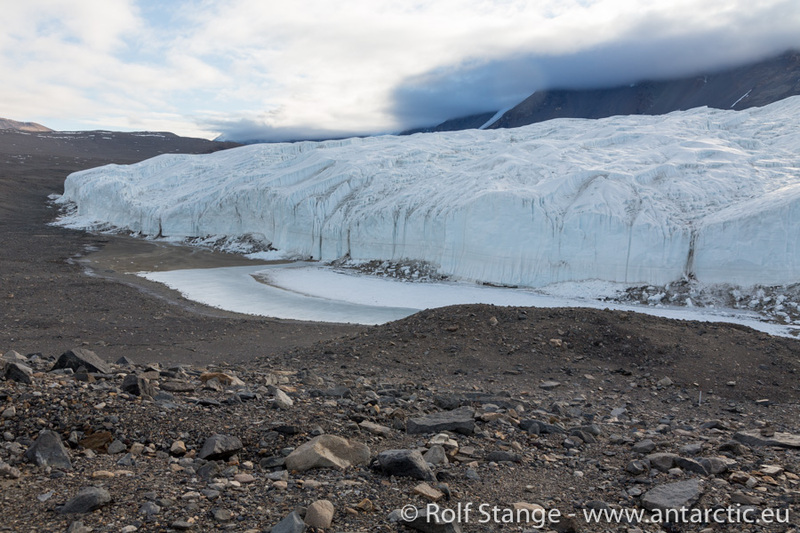 (Click here for a virtual visit to Scott’s Terra Nova hut at Cape Evans). Cape Royds is just some miles north of Cape Evans, but I watch conditions during the short crossing there with mixed feelings. The landing area is exposed to the south, into the wind. And as we are to see soon, the landing bay is full with ice. 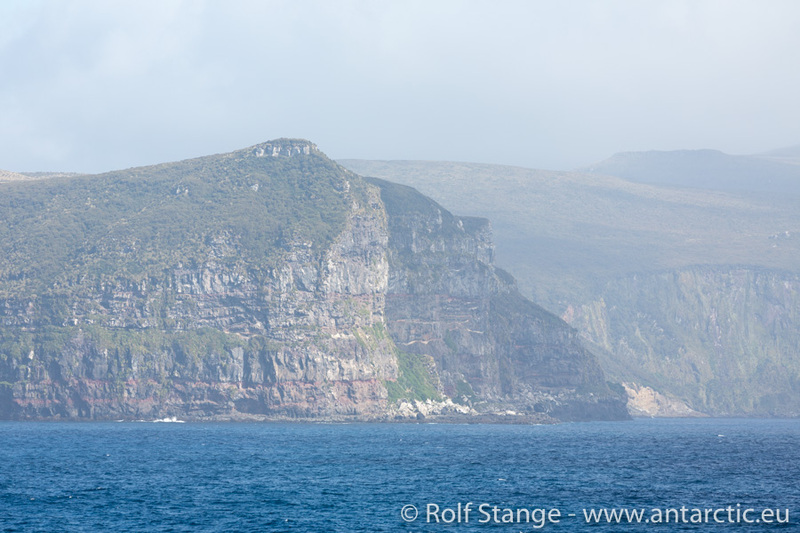 The low clouds prevent any tought of using helicopters to get us ashore. 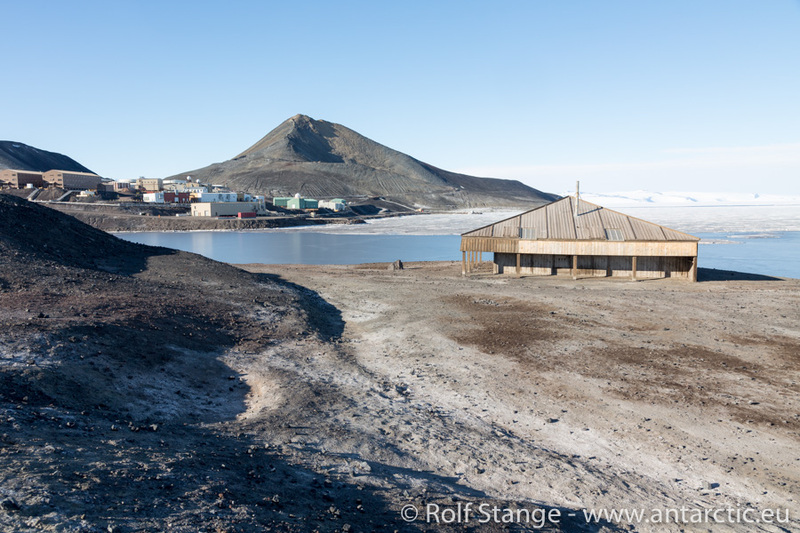 Today is not a day for Cape Royds, so we have to make do with a distant look at Shackleton’s Nimrod-hut. 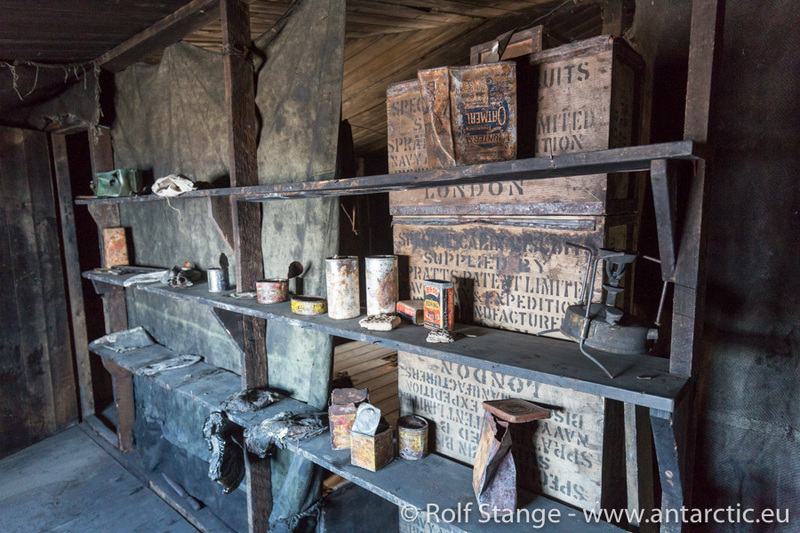 (Click here for a 360 degree panorama visit to Shackleton’s hut at Cape Royds). 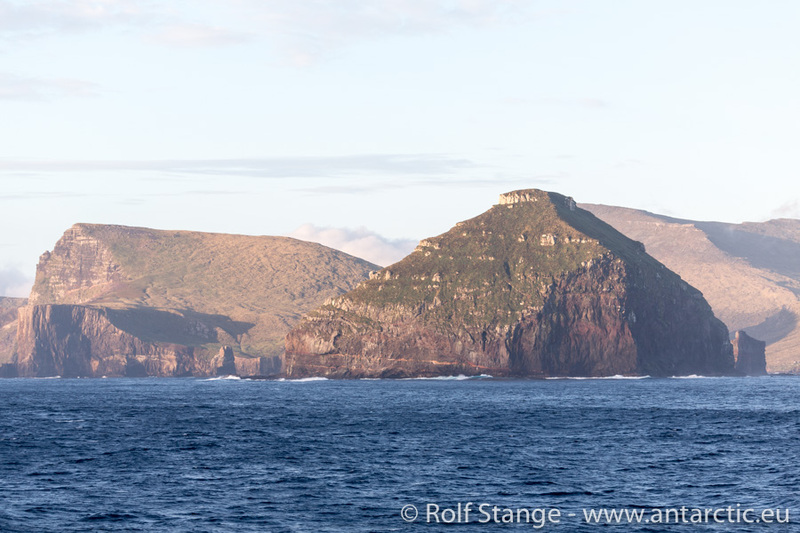 But leaving from Cape Royds relatively early was to give us one of the most beautiful evenings of the whole voyage. 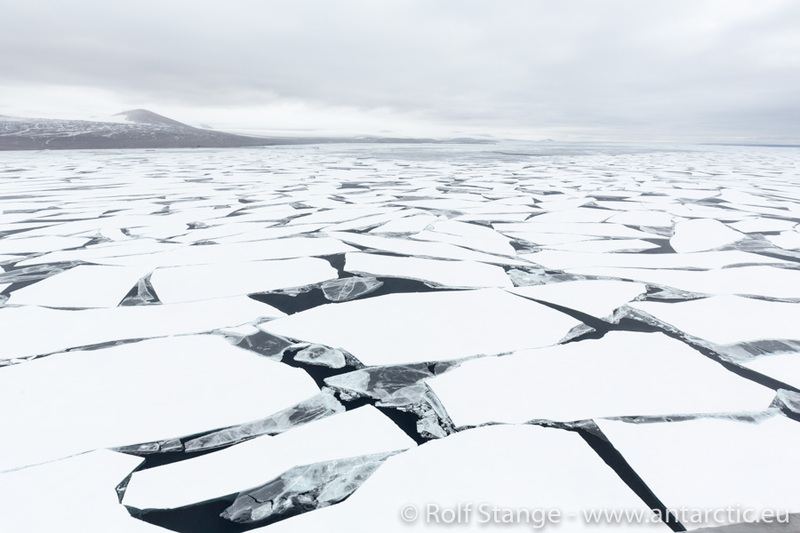 After a few hours we have reached the ice edge in the inner McMurdo Sound. The air is icy cold, but calm and clear. The evening light brings warm colours into the cold atmosphere. 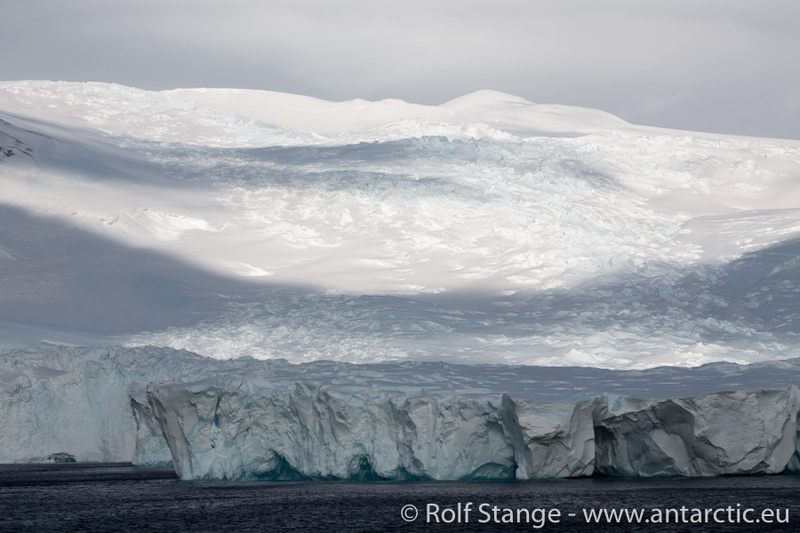 The ice edge is stretching miles and miles towards the horizon, which is crowned by the mighty silhouette of Mount Discovery and, a bit to the right, the endless chain of the Transantarctic Mountains. 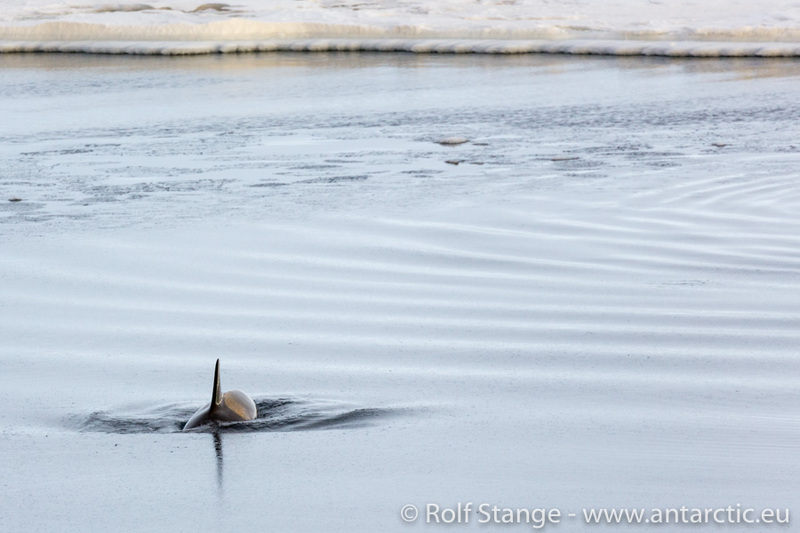 And in the water: orcas, orcas, orcas. 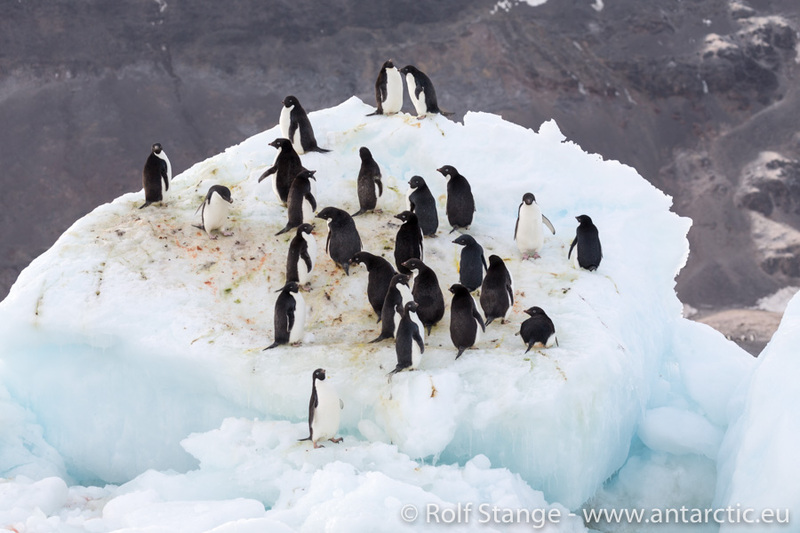 Everywhere near the ice edge lows, suspiciously watched by small groups of Emperor and Adelie penguins every here and there. And we are in the middle of this amazing scenery. The evening will remain in our memories as one of the true highlights of this trip, as the whole day. 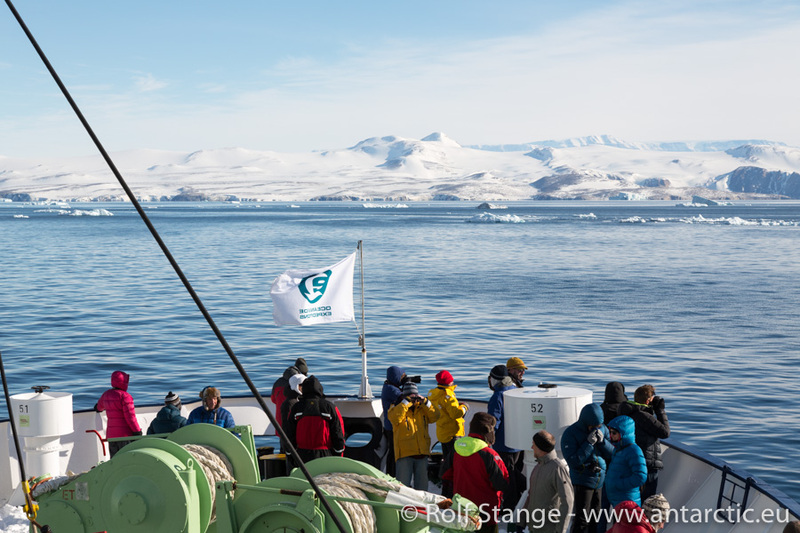 Today is finally the days that sees us arriving in McMurdo Sound, a key area for our voyage. 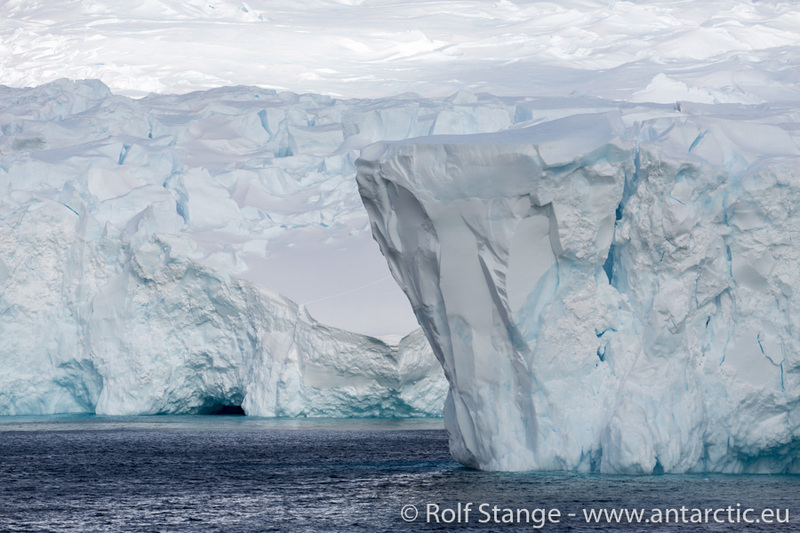 This is probably what most people think of when they imagine the Ross Sea. But hard to get to. The first early morning look out of the window is not too promising: grey, grey, grey. Ice floes and whirling snow. Not good, as our birds need to see something in order to fly. Patience is the one and only thing that helps. Frequently, I meet with the pilots and the Captain to assess the weather development. 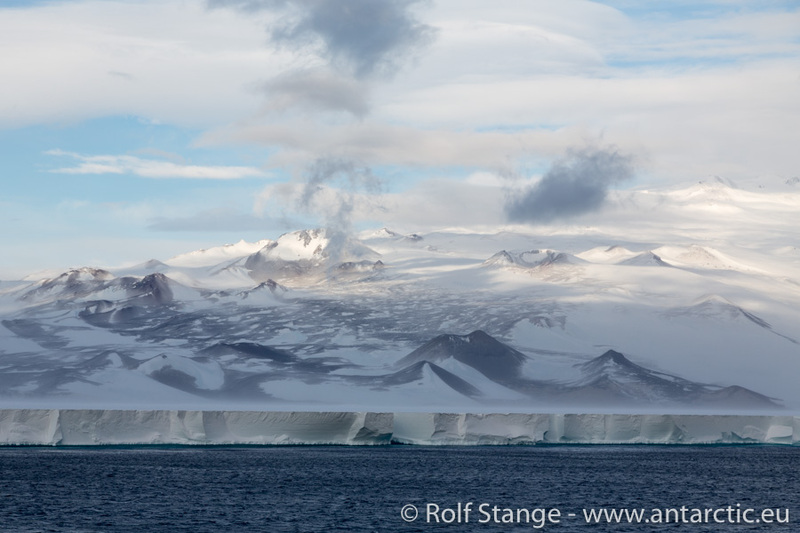 Slowly, slowly the visibility is improving and we can see the Transantarctic Mountains just a few miles away, but the clouds are still hanging low. In the late morning, chief pilot Felipe suggests to make a reconnoissance flight to check the conditions on location. Felipe makes some loops over the Canada Glacier and hovers a few metres above the projected landing area, checking the clouds above and the turbulences near the ground. Finally he gives his thumbs-up. 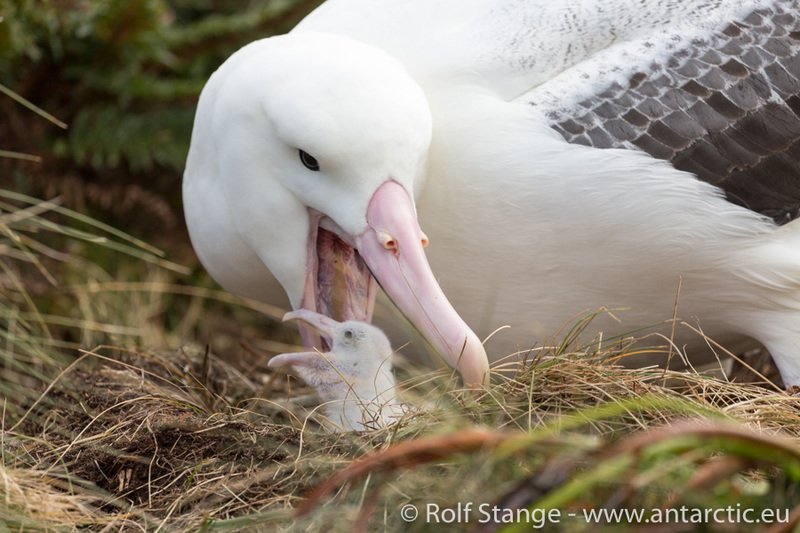 Back on bord, anxious eagerness gives quickly way to joyful anticipation after I have made my announcement. Some final preparations are quickly made, a banana has to be enough for lunch, the first helicopter for the field team is soon ready for departure, there is no time to lose. Who knows how long the weather is going to last! 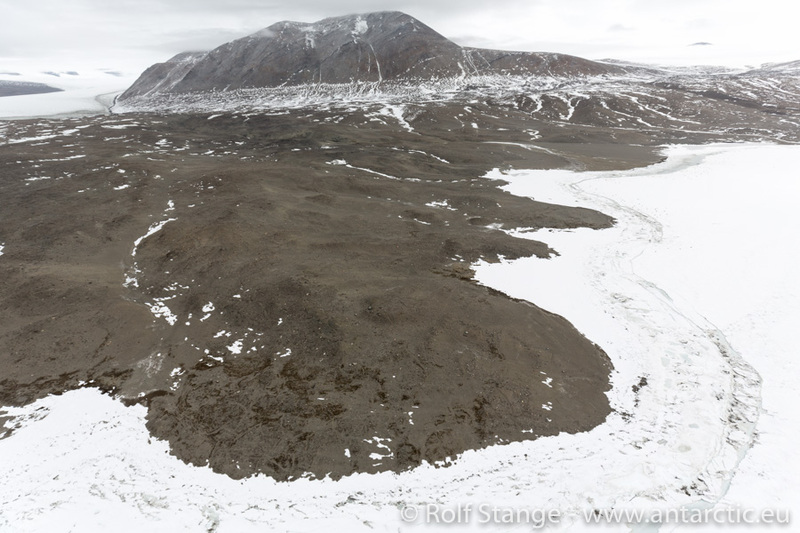 It is a flight of 19 miles over broken sea ice, barren land decorated by ice wedge polygons, the Commonwealth Glacier and then Lake Fryxell before we reach our area near the Canada Glacier. We unload the mandatory safety equipment and then we are ready. Meanwhile, helicopters number two and three are prepared on board, and soon the machinery is running. Everybody is coming out in small groups, helicopter by helicopter, one by one. It is a long operation, taking quite some time. People come flying in, get off and remain in awe for a little while. We have to reduce time on the ground to a minimum for safety reasons, we have no idea how long our weather window will last and we don’t want to have too many people out here in case we need to get out of here quickly. This is really not a place to get stuck in bad weather. But the weather remains stable, it even improves, the sky is clearing up a bit, exposing some lovely blue spots, with sunbeams illuminating the scenery as with spotlights. Finally we can happily finish a long, great afternoon. Everybody has had the rare chance to fly into Taylor Valley. We were very likely the first people after our own last visit two years ago, there is no other ship carrying helicopters (and on the previous trip, just a few weeks ago, Ortelius did not have a chance to get anywhere near this area, as the whole McMurdo Sound was still full with solid fast ice). A wide belt of dense drift ice is stretching out into the Ross Sea from the coast south of the Terra Nova Bay. Much further than indicated by the satellite images. So we spent much more time navigating around the ice than expected. 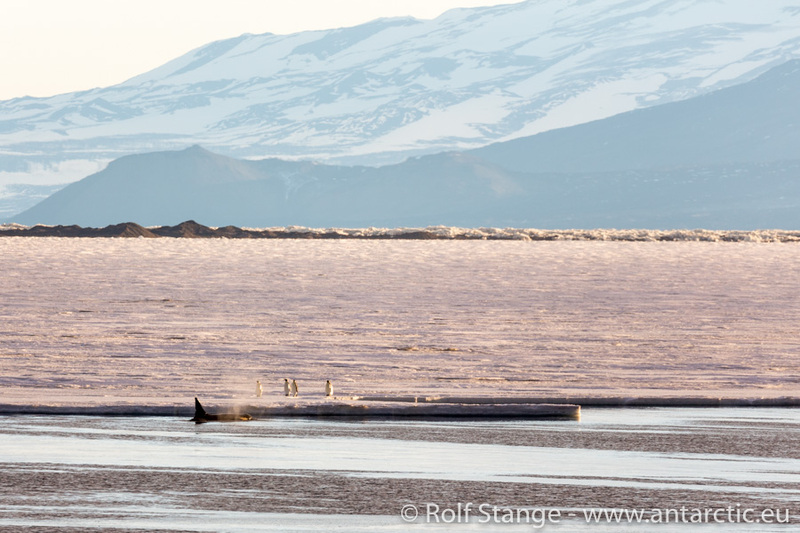 That is actually good news: what would the Ross Sea be without ice? The time loss does not bother us too much so far, we can afford it after the fast crossing from New Zealand. We take it as it comes, and what comes is an completely unexpected visit to Franklin Island. 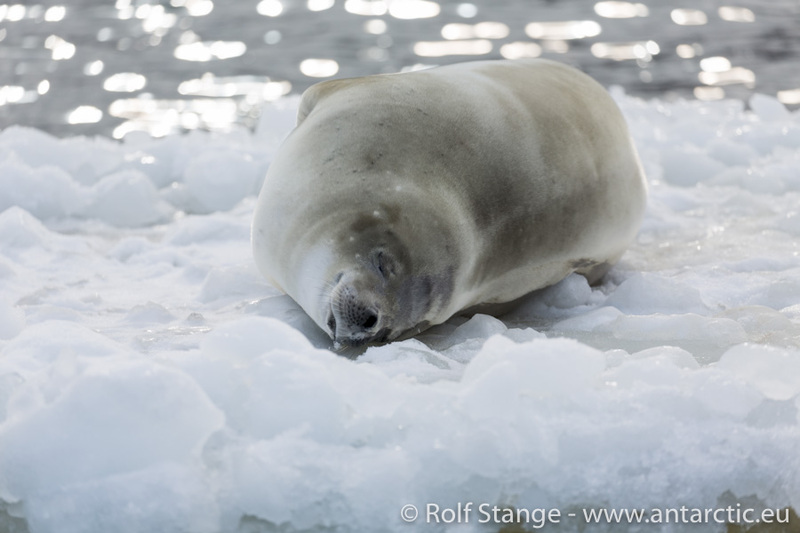 The island lies totally explosed far out in the Ross Sea, which today is flat and peaceful, allowing us to go ashore without any problems, although it is a long zodiac ride from the ship across the uncharted waters. 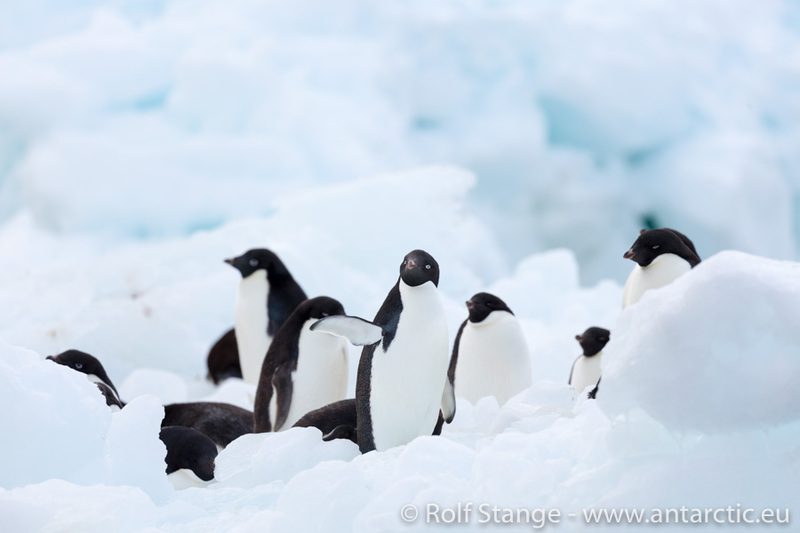 Most of what should have been more than 100,000 Adelie penguins have already left the colony, but a surprisingly large number of them is still at home. Somewhere an Emperor penguin tried to hide amongst them, but he is quickly spotted thanks to his significantly larger size and the attractive colouring. 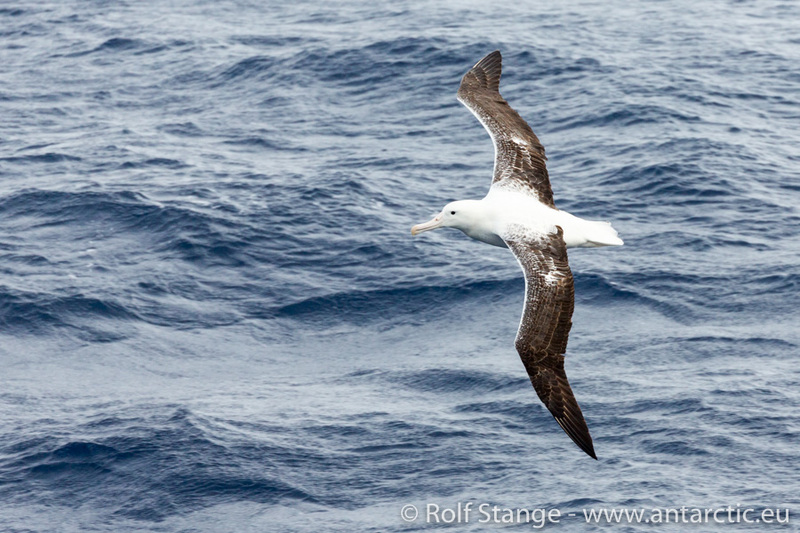 The distances are large also within in the Ross Sea, so we can dedicate the morning to some hours of rest. Nothing wrong about that. 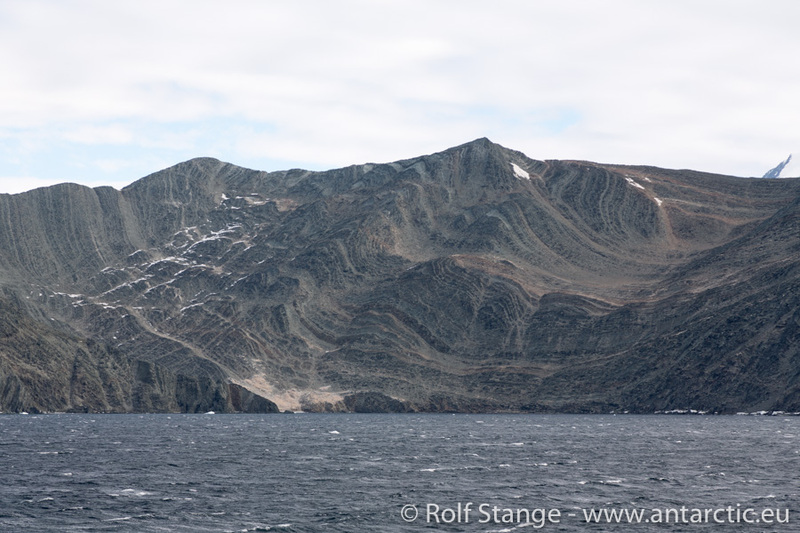 But then our hopes and expectations are rising, as we approach the western coast of the Ross Sea again, the Transantarctic Mountains around Terra Nova Bay. 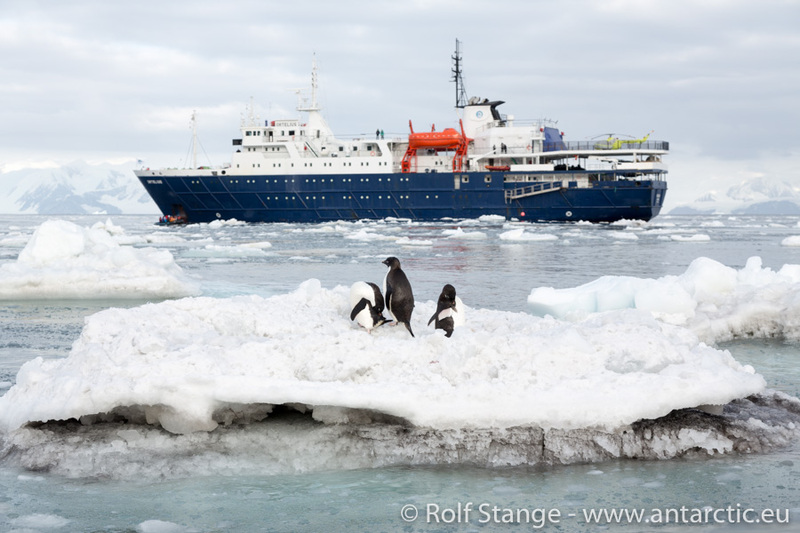 We sail past the mighty Cape Washington, home to an Emperor penguin colony in winter. 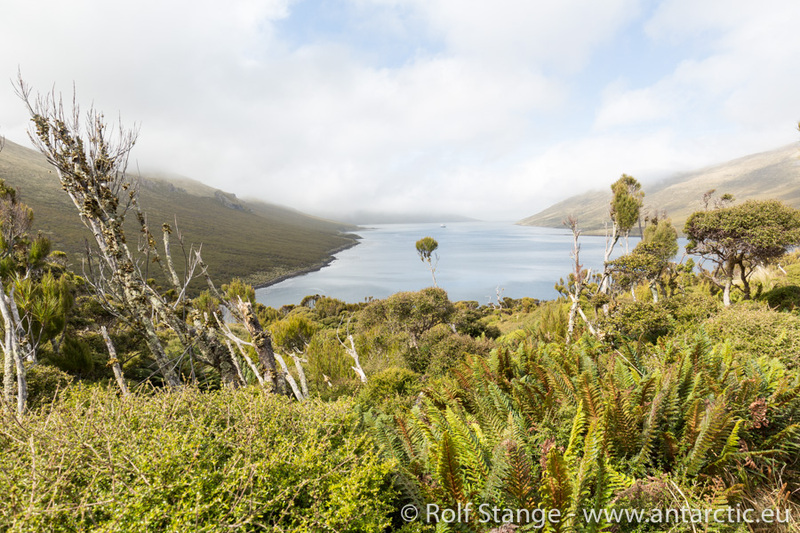 Mount Melbourne is towering in the same section of the panorama, a large, volcanic cone of beautiful symmetry. Terra Nova Bay is something like the King George Island of the Ross Sea. There is a large number of stations on King George Island in the South Shetlands, everybody has to have his flagg flying there. Over here, there are three stations within a few kilometres. Germans and Coreans can visit each other with just a short walk, whereas Karl and Lee will need a boat for an Italian dinner. But Karl and Luigi have already left and closed their respective places down for the winter, they will only be here during the summer. After a lot of background communication with authorities and station leaders, we decided to have a closer look at the Italian Mario Zucchelli Base. Just the prospect to step on good, solid antarctic granite was a good one, not to mention those on board who have an Italian connection. Some of them felt immediately at home! Mario Zucchelli Base may not be the most scenic place in Antarctica, something it has in common with most stations except some of the older ones, which blend nicely into the landscape. The modern ones are usually collections of container buildings crowned with satellite dishes and surrounded by heavy vehicles and other technology. So we don’t spend too many hours in little Italy, in order to have time for another little landing, namely at the German Gondwana-station. Gondwana is another summer-only based, they have only done maintainance work this summer, but no science. 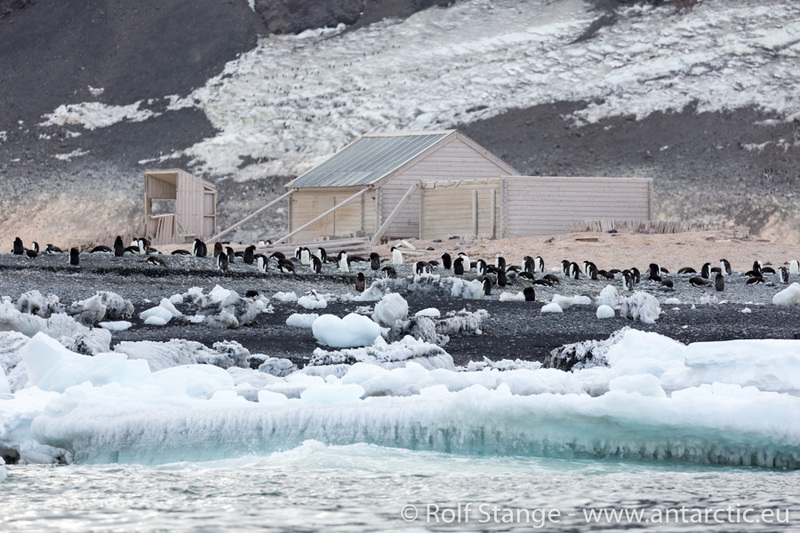 As at Mario Zucchelli base, there is nobody here anymore and the station is ready to face the antarctic winter. 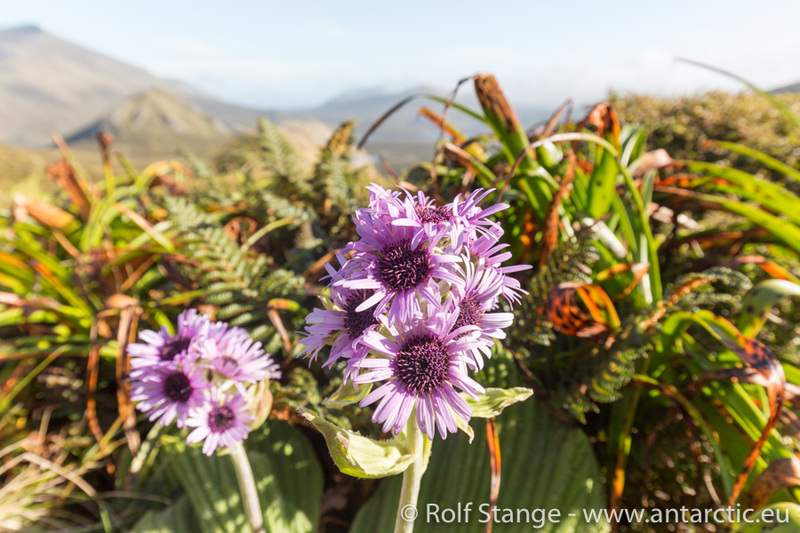 The Gondwana is much smaller and the terrain allows lovely views over the surrounding scenery. 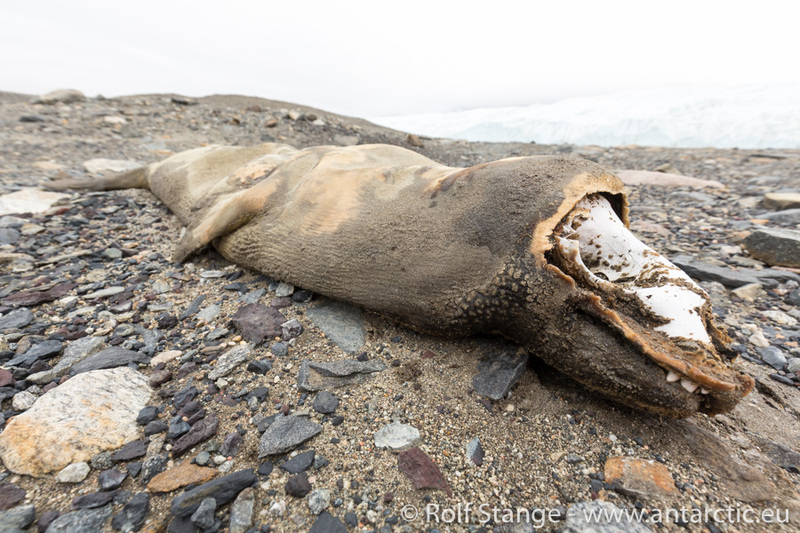 Some Weddell-seals are hauled out on land near the beach. 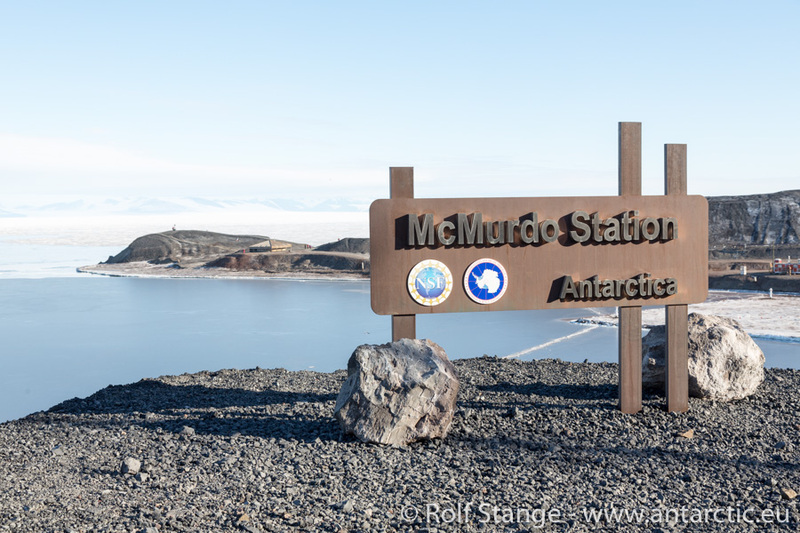 We enjoy the whole setting for a while, and then it is time to set course for McMurdo Sound. 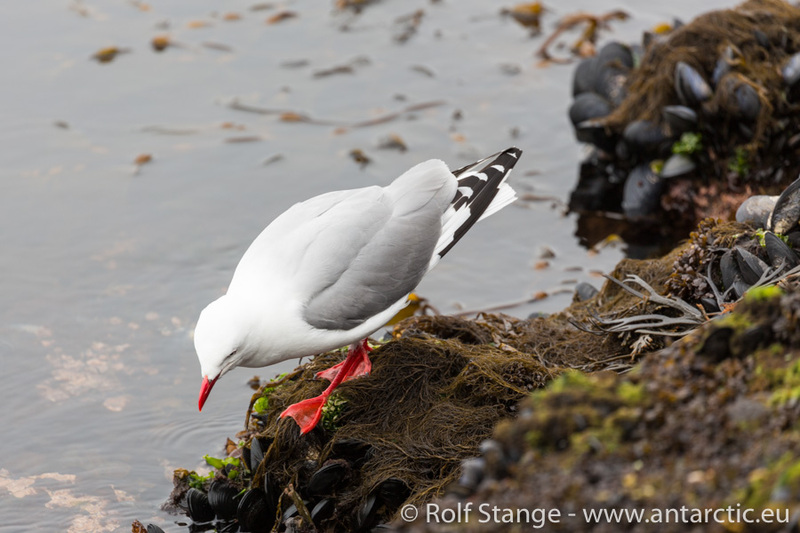 Of course there was a growing urge to set foot on shore, but that had to wait for another while. We had been hoping for a Zodiac cruise at the Possession Islands, but it was definitely too windy to venture out into the small boats. But also from the ship the islands are a view not to be missed. Rugged coastlines with cliffs and arches. 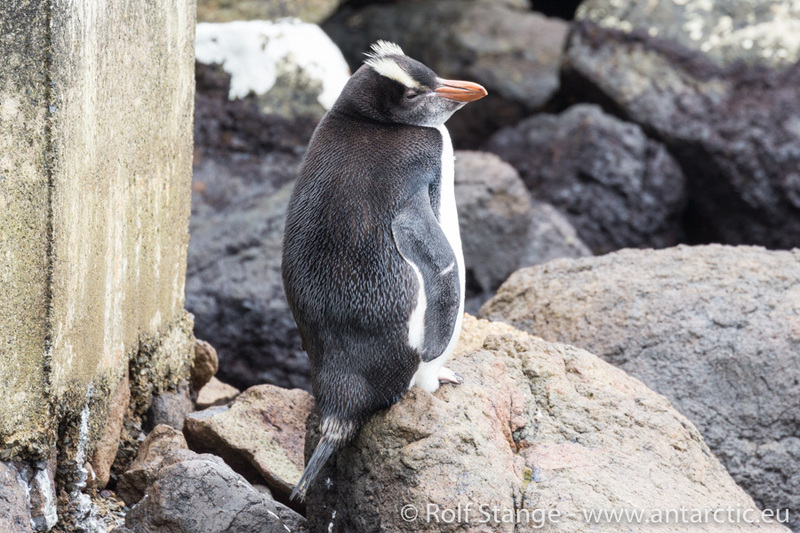 On the northern one of the two main islands, the famous James Clark Ross went ashore in 1841 to take the new land into possession for his country – hence the name. »We found the shores of the mainland completely covered with ice projecting into the sea, and the heavy surf along its edge forbade any attempt to land upon it ; a strong tide carried us rapidly along between this ice-bound coast and the islands amongst heavy masses of ice, so that our situation was for some time most critical; for all the exertions our people could use were insufficient to stem the tide. But taking advantage of a narrow opening that appeared in the ice, the boats were pushed through it, and we got into an eddy under the lee of the largest of the islands, and landed on a beach of large loose stones and stranded masses of ice. The weather by this time had put on a most threatening appearance, the breeze was freshening fast, and the anxious circumstances under which we were placed, together with the recal-flag flying at the ship’s masthead, which I had ordered Lieutenant Bird to hoist if necessary, compelled us to hasten our operations. You need to have the nerve to go ashore under such circumstances, when getting there and back involves several miles rowing rather than a rapid zodiac ride powered by 60 horses. Ross did have the nerve, we rather enjoy the views from the ship, a warm cup in the hand. Also Cape Hallet does not want us ashore. The beach is blocked by ice and surf, quite similar to Cape Adare. This turned out not to be a bad thing at all. 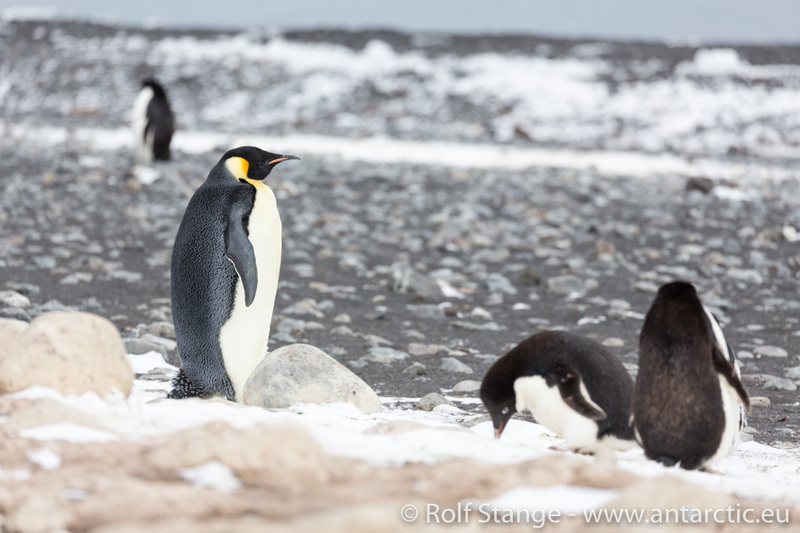 Not only were the impressions that we got from the drifting ice and the icy shores from Zodiac probably much better than would we would have seen in a deserted penguin colony on a flat gravel peninsula, but we found an Emperor penguin on a bergy bit. The coffin had to be carried several hundred metres up a rather steep, icy mountain slope, and then a grave had to be blasted into the rock with dynamite. It is said that Hanson’s last wish at the end of his long disease was to see the penguins again when they would return to Cape Adare. His comrades captured the first pinguin that came back and brought it to Hanson’s bed. Soon thereafter Hanson died. Never has a family member been to Hanson’s lonely grave. It was our mission to change this, a mission that had been prepared by a permitting process of several months. In the end it is just a matter of a helicopter landing on a rocky mountain ridge devoid of life. The mission is happily completed in the earliest morning hours. 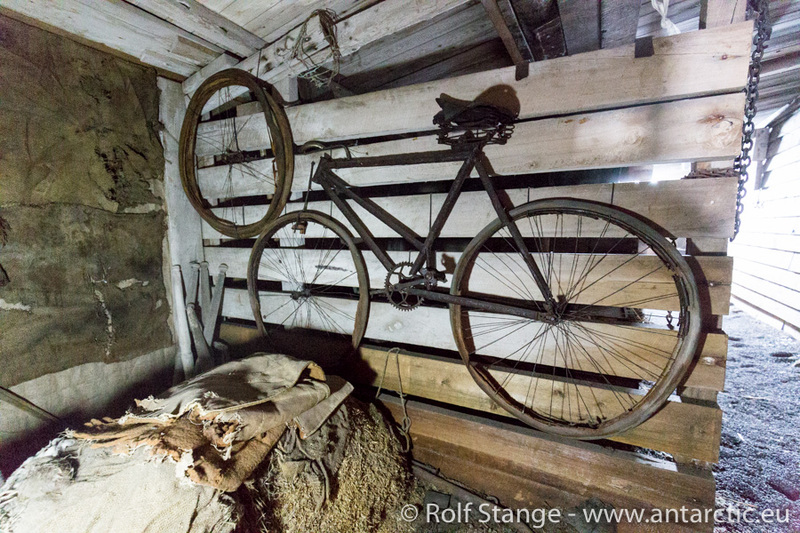 The second mission, to get everybody to Borchgrevink’s famous wintering hut, the oldest ever human-made construction on this continent, turns out to be more difficult. 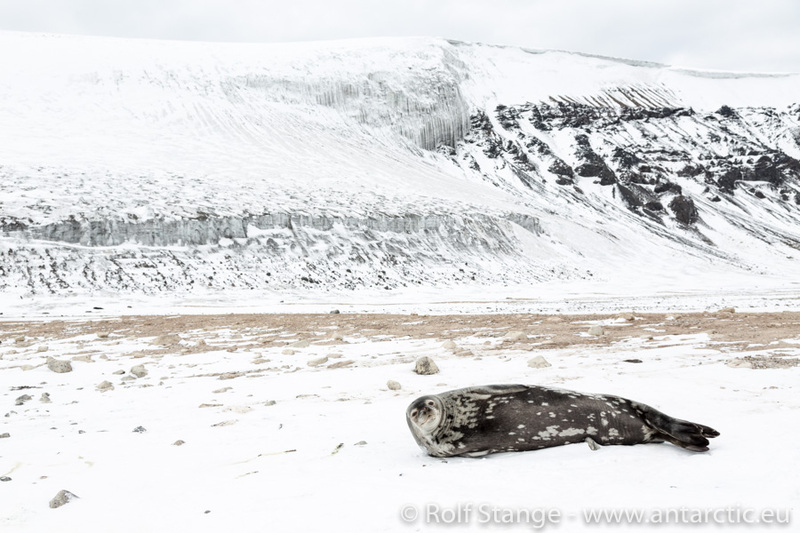 Cape Adare is notorious for wind and ice. The wind does not create any troubles today, but the ice are an obstacle that we can not overcame. It is just a strip less than 50 m wide, blocking the beach of like the wall of a fortress, but the growlers are hundreds of tons heavy and they are moved around by swell and current. A very dangerous combination. 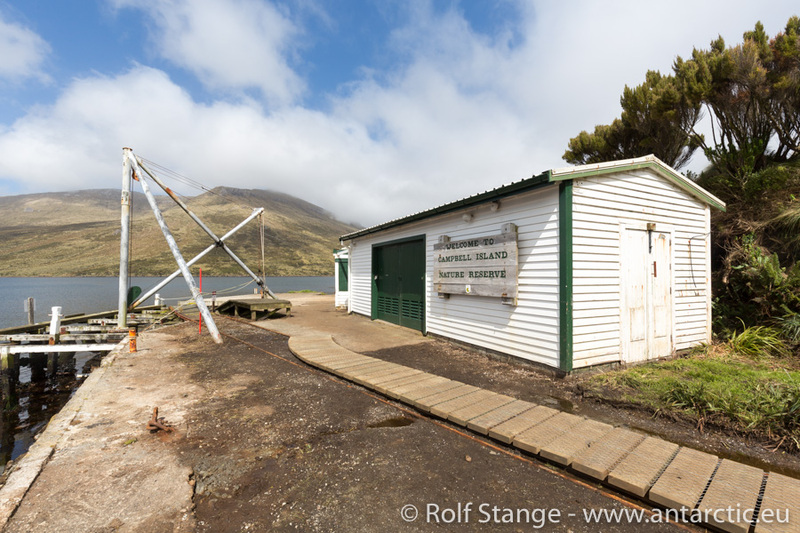 This does not keep us from getting as close as we can to the coast, the land and the hut with the Zodiacs. And that is pretty close and impressive. 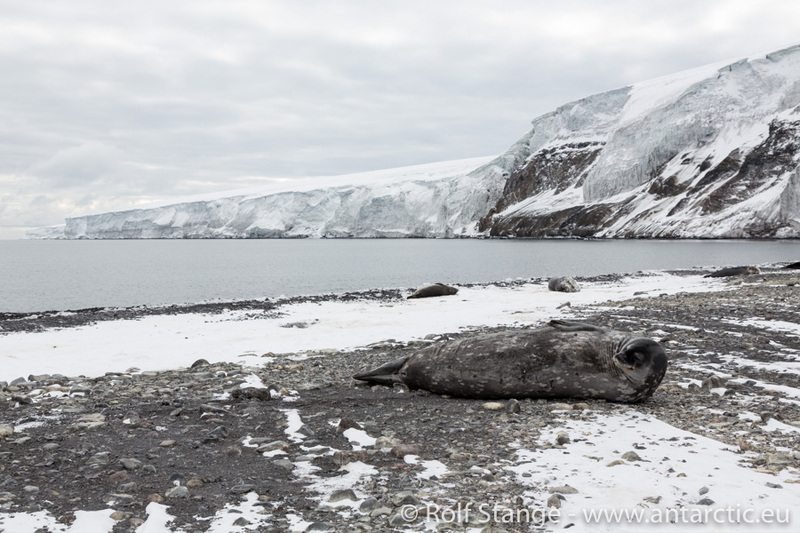 Ice, Adelie penguins, Crabeater seals. The sheer display of power that is created in the interplay between heavy ice and moving water is maybe the most impressive part of the whole setting for me. 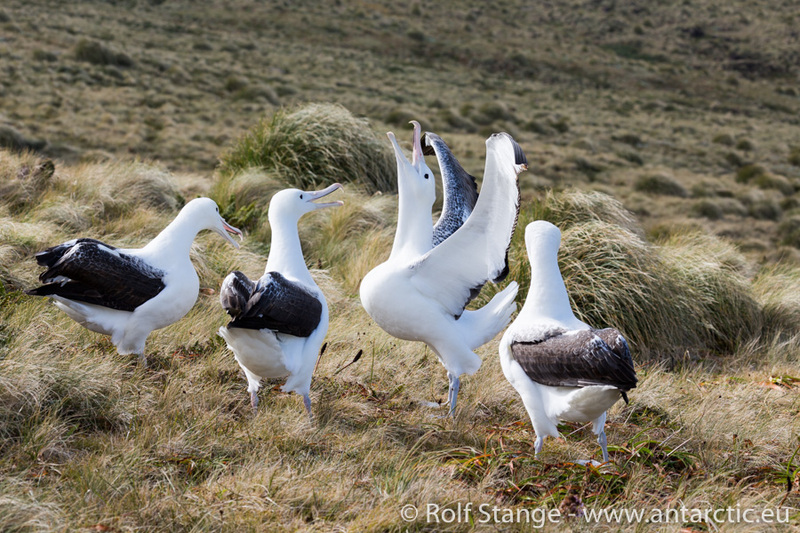 The Southern Ocean does have a good reputation for bad reason. Talk about the furious fifties and the screaming sixties. That brings a couple of question marks regarding our wellbeing during the days of the crossing and the time frame. A force 10 on the nose, and you can suffer and watch your precious time melt like ice in the sunshine. And this time? King Neptune is with us so far. We have got a lively westerly breeze for some time, but it just brings a little training session in becoming a sailor. No more than that. 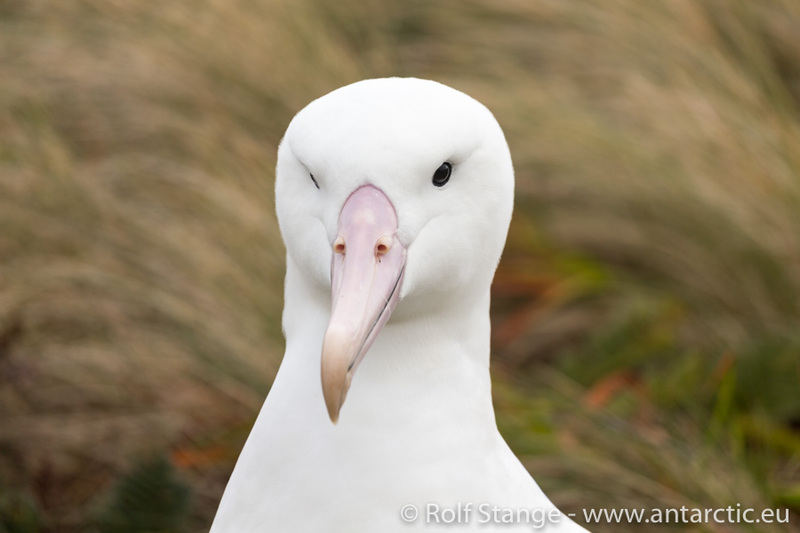 We can keep an average speed of a good 11 knots, which takes us in a mere four days from Campbell Island to Cape Adare. An easy and relaxed crossing, we are doing well! 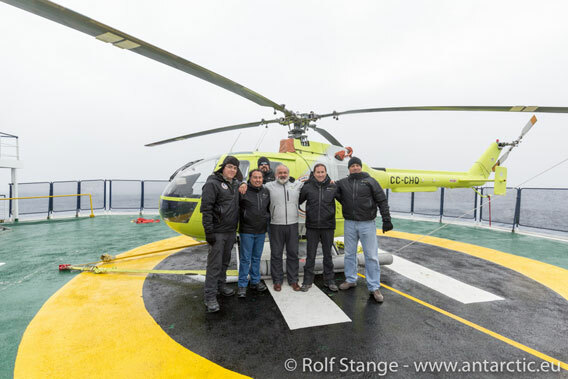 The picture shows our good helicopter pilots and mechanics while preparing flights in Antarctica. We hope to give them a lot of work in a few days time! There is a fair and steady breeze blowing around the southernmost corner of New Zealand, the sun is shining, warmly and strongly, the air warmer than I have experienced it for quite some time. 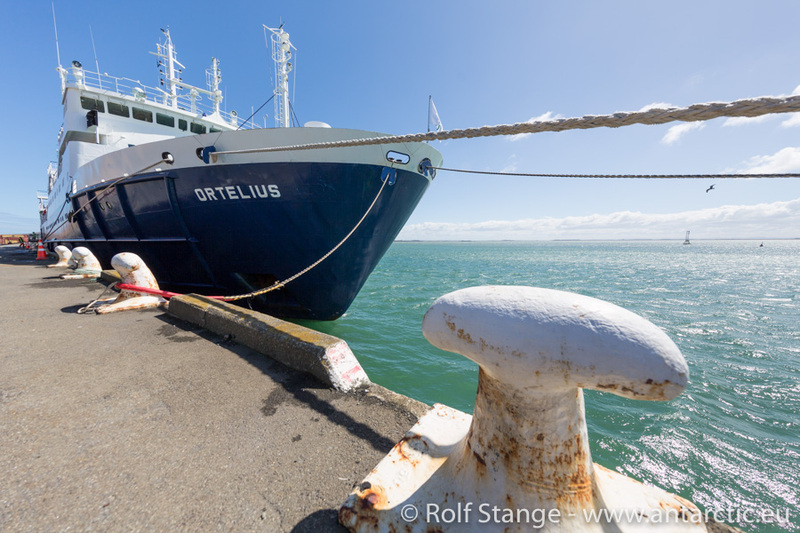 Exactly 100 passengers from almost just as many countries have found their way to our ship, the Ortelius, and everybody is curious what the next weeks will bring. 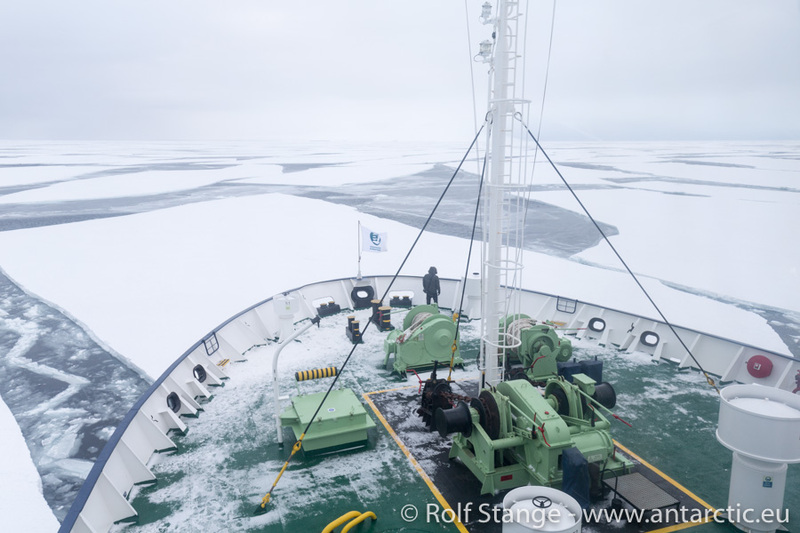 It is the beginning of an Antarctic Odyssey, more than 6000 miles are ahead of us. 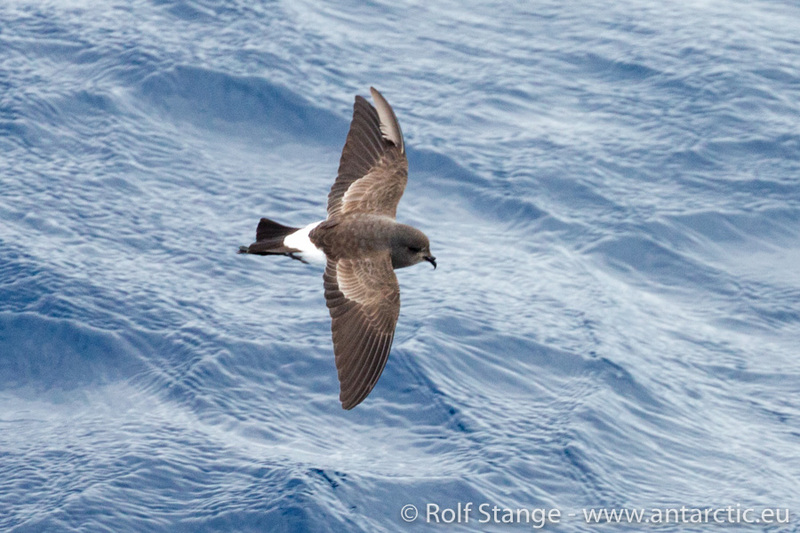 A light, pleasant breeze is blowing during the first few miles, we have set course south for Campbell Island. Two years ago, we spent more than a day looking at the island in force 10 winds and beyond. Which was, in a way, impressive and beautiful, but going ashore is the real thing. Will it work this time? We are curious, fingers crossed. It would be a dream come true.